The secret to poinsettia success begins with a small, healthy plant in a 4-inch pot, which in November and December is not difficult to find. Small poinsettias are easier to care for and more fun to display than enormous specimens in 6- or 8-inch pots. Remove foil wrappings at once — they are death traps. Then set the plant in a sunny but cool window (55-65 degrees is ideal). It is dim light, high heat and low humidity that cause leaves and colorful bracts (we call these bracts “flowers”) to prematurely wither and drop. Provide water, but only when the top soil looks and feels dry. Be sure to water thoroughly, until excess seeps from the drainge hole. Then promptly empty the saucer beneath. Poinsettias will not tolerate wetness at their feet. 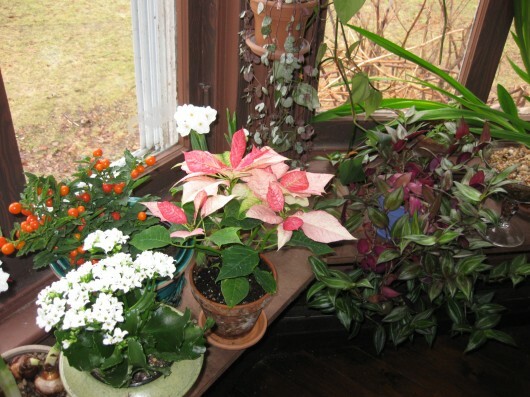 In my south music room window, a dusty pink poinsettia associates well with purplish-green tradescantia, white kalanchoe, orange “Christmas Cherry,” and paper-white narcissi. Red varieties, such as the 3 in my bathroom window garden, make a stunning scene there in conjunction with green ferns and vines. I’m not particularly fond of white poinsettias, although these too look well when placed among green growers. If you can’t bear the sight of “Christmas” plants after New Year’s Day — I certainly can’t — move your Euphorbia to a less-public window. I move mine in early January to the east window in my little-used guestroom. There, the plants reside on glass shelves and receive daily inspection for water. In June, when all the other houseplants go outdoors, my poinsettias do too. I cut their tops back to 3 inches at this time, and then repot the plants into fresh soil. To fit them back into 4-inch pots, I find it’s necessary to prune the roots a little. How they thrive during their summer sojourn in light, open shade on the front porch. I pamper them with regular watering and weekly feeding. As new leaves form, stems are pinched back frequently to keep growth bushy and low. The first week in September, plants must return to indoor life. Mine return to the guestroom. Since poinsettias are short-day, long-night plants, to bloom they must have definite darkness for at least seventy days. And that darkness must not be interrupted by so much as the gleam of a street lamp. I set them inside the cabinet that forms a broad sill for the window, where their dark schedule is 8pm to 8am. With this routine, you can count on your investment of one Christmas to pay rich dividends for Christmasses to come. And let me tell you — the satisfaction of reblooming a poinsettia is substantial indeed. I've never had luck with poinsettias. That's probably because my house is too dry in winter. But your plants look wonderful. I especially like the window picture. Something about that window reminds me of the old South. Maybe the poinsettias, maybe the urn…can't quite put my finger on it. Do you notice this, Kevin? Samantha – yes, I did! Must be the red poinsettias, which we are so accustomed to seeing in association with evergreen boughs and Christmas trees. They look entirely different, and, I'll admit, entirely acceptable, in the after-the-holidays-window-garden! Guess I'll have to change my tune about the reds! Kevin, what are the other plants in your guestroom window? I think I spot a fancy leaf geranium at the rear of the window. Carol – YES! That is the fancy-leaved Pelargonium 'Mrs. Henry Cox,' a beauty in all seasons. Also on the guestroom sill is the Christmas Rose, Helleborus niger; Narcissus paperwhites and Sweet Olive, Osmanthus fragrans. 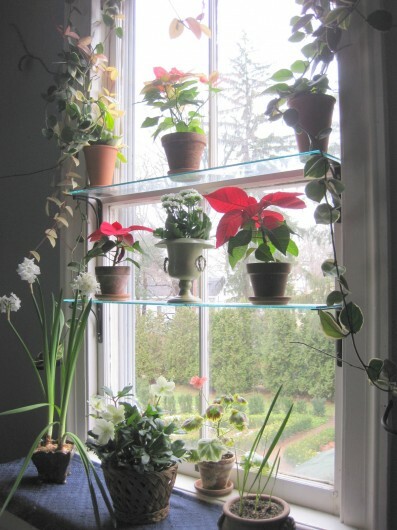 First shelf, flanking the two red poinsettias, is a white kalanchoe. Second shelf, a dusty rose poinsettia, between pots of hoya. The hoya vines are trained on wire, to serve as a frame for this simple but satisfying window garden. The heleboris looks lovely in the window display!!!!!! Thanks for the tips Kevin. I purchased 3 pink poinsettias and predictably the leaves are starting to fall. I will follow your suggestions and see if I can “weather them over”. Sue – Your plants are lacking humidity. Set them on a humidifying tray of pebbles and water. Oversized, pebble-filled saucers are a useful alternative to the tray. I finally kept a poinsettia plant nearly a year and am in the process of trying to get it to re-bloom. Wish me luck….and thank you for your instructions on how to do it! 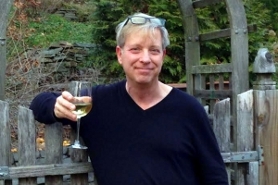 Patty – good for you! Adhere to the schedule above, and believe me, your poinsettia will deliver those colorful bracts. Patty – Thanks for sending, and congratulations! Love the rose-colored bracts. If, in spring, you take cuttings of this plant, you will have an entire forest of poinsettias for next winter's show. James – You could absolutely plant your poinsettia outdoors in June, if not May. However, if your intent is to bring the plant indoors at summer’s end, and then “re-bloom” it, there is one caveat: Unconfined to a pot, the plant’s roots will spread and spread. You’ll have a hell of a time trying to get it back into a pot without first cutting off most of the roots. An equal amount of top-growth will have to be cut, too, in order to make up for the now-missing roots. As you can imagine, the plant will not be happy with all this meddling. Consequently, consider this back-up plan: When you plant your poinsettia outdoors, take a few cuttings, too. Root each of these in a 4-inch clay pot of good soil. To encourage branching, pinch off the first new leaves which appear. By September you’ll have a small collection of young plants which will be ideal for coaxing into bloom. I swear, your window groupings are always so inspirational! I have three poinsettia(s) at work that I kept alive from last year, they are flourishing and green, I have yet to attempt to get them to bloom again. Never thought to pinch them back. They’re a bit woody along the stem, so should I go for maybe a six-inch trim? With your easy-to-follow guide, maybe I’ll attempt to rebloom the new plants we got this year. [I am the rescuer of plants :D] Maybe I’ll take better care of them than I have in the past… Here’s wishing me luck! Donna B. 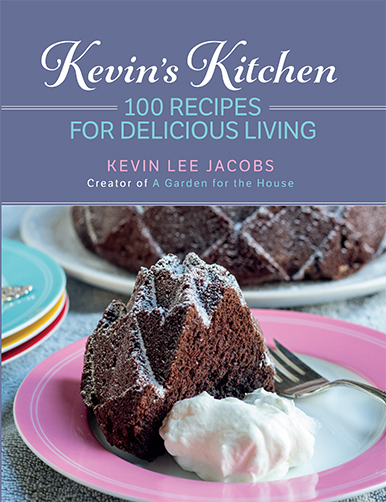 – Good for you for saving and nurturing those poinsettias. I think they are beautiful plants, whether they are adorned with colorful bracts or not. You can certainly encourage small, bushy plants by cutting yours back to a size which pleases you. It’s best to accomplish such pruning in spring, however, when the days are longer and the plants are itching to grow. And why not root some of the trimmings? These you can force into “bloom” next winter, as holiday gifts for your co-workers! Do I have this right–when you bring it in you put it in total darkness for, was it 72 days then 12hrs dark every day? 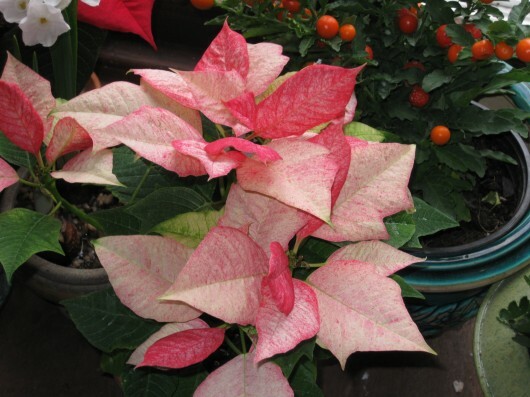 How about the newly bought poinsettias, are you to keep them in the 12-12 cycle? I’ve had them last beautifully until march-april when they drop their leaves and I have tossed them. Thank you for letting me know how they can live on.